This new LED lightshow tree features 14 animation sequences that automatically loop to create an amazing display. Animated effects include fades, strands of lights chasing around the tree, staggered fills, chasing twinkles and more. Installation is quick and easy, so you can have an incredible light show in just minutes! 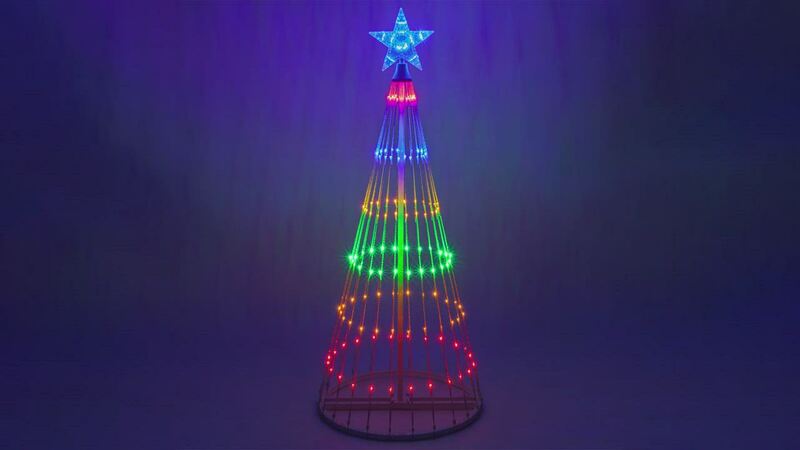 Mesmerize the whole neighborhood with this eye catching, animated Christmas tree. Available in a variety of sizes with energy saving red LED lights. I have had two replaced so far and the third is on its way due to the fact that the lights stopped working. Christmas Lights Etc. has been very helpful in the replacement process. Reviewed by Dan W S.
Nice looking tree and bright. Took a little time to set up but, went good once I got going. Got this for next Christmas so I'm not sure how it will be in snow. Would like to buy another one later. The red has a nice glow in the dark which is a good attention seeker. Excellent product. Definitely would buy another. It is an eye catcher at night! I like the tree and it displays different light animations from blinking to chasing to dimming, etc. I only wish that it had an option to let you pick which light variation you wanted. Also, I am hoping that where you connect the light strands at the bottom of the tree post with hooks stays connected in windy weather. They seem a little loose, but will not know until it is outside in December. Other than that, the tree is nice and I would recommend.